Dashing Doggie was created when my dad passed away and I inherited his dog named Cody. I promised him that I would look after him and take very good care of him. 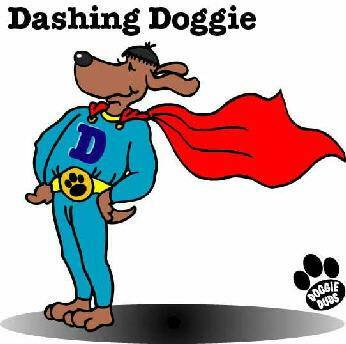 Dashing Doggie is a hero dog named simply.....Dashing. He was created to "look after all dogs everywhere". Our mission is to provide you and your loved one with the very best available in fun products. We also work to educate children and the general public on pet responsibilities and advocate safe shelters. Dashing Doggie is able to donate to many dog charities thanks to our many customers. Thank you for helping us to help others. The Zube for Guinea Pigs and all of your small friends! You can print the treat order form to mail, for your treat orders. Currently I am accepting checks and money orders for payment.